This section of the Web Help Desk tech training describes how tickets can be created, how to create a ticket through the tech interface, how to create a ticket through email, and the Web Help Desk ticket assignment logic. Use this material as it is, or copy and revise it to reflect your organization's practices and Web Help Desk configuration. In addition, techs with the required privilege can define Web Help Desk tasks (scripts) which will create certain types of tickets automatically. 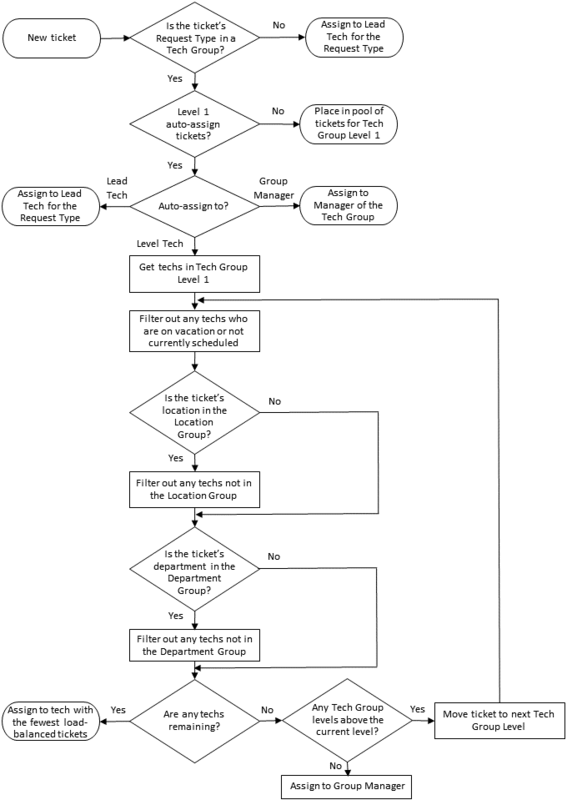 The Assign To field is displayed, showing which tech group will receive this request based on the Web Help Desk ticket assignment logic. You can override the ticket assignment logic and assign the ticket to yourself. Web Help Desk uses the ticket request type, location, and department to determine which tech group should handle the ticket. Within the tech group, Web Help Desk looks at each tech's availability (the tech's work and vacation schedules) and workload. See the following chart for details.